Pokémon GO, the popular augmented reality game from Niantic, received a new update today, pushing the game into version 0.31.0. While most of the changes in this update are minor, there are a few important updates which address broken and sub-par features. The most important feature that was addressed in this update is the footsteps tracking feature, which – due to a glitch – has been unusable for the past few weeks. In this feature, Pokémon were rated on how close they were to the player by the number of footsteps seen with them in the “Nearby” menu; the closer the Pokémon, the less number of footsteps that will be displayed. For the past few weeks, every Pokémon has had three footsteps (the maximum number) in this menu, regardless of how close they actually were to the player. This forced players to rely on third-party services such as PokéVision in order to track down nearby Pokémon (even though Niantics CEO has stated they think these services take the fun out of the game). Version 0.31.0 has completely removed the footsteps portion of the “Nearby” menu for the time being – presumably, future Pokémon GO updates will restore a working version of this feature, but that information was not included in this update. The next big update concerns battle mechanics. The battle damage calculation has been modified, and certain Pokémon moves have been either nerfed or buffed. This is presumably so that Pokémon Gyms aren’t staffed by the same few Pokémon, and to encourage a more diverse metagame. The Pokémon fansite Serebii.net has a moves page which details all of the fast and special moves in the app; check to see if any of your Pokémon were affected by the moves update (lighter tabs are moves that have been buffed, darker tabs are ones that have been nerfed). The final important update in version 0.31.0 is that players can now re-customize their character avatar in the Trainer profile screen. This is perfect for players whose clothes clash with their chosen team (you don’t want to claim a gym for Team Mystic if you’re dressed in Team Valor’s colors, for instance). 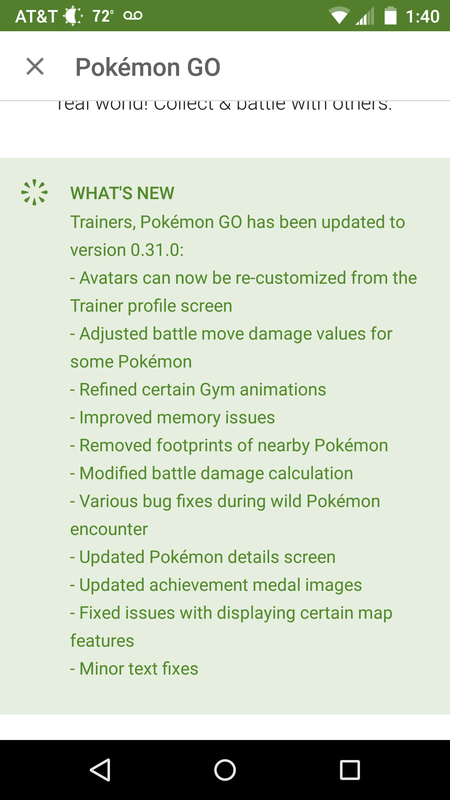 Additional features such as Pokémon Gym animations, achievement metal images, and memory issues were also upgraded in the version 0.31.0 update. And while it wasn’t a part of this update, it’s important to remember that spawn locations for certain Pokémon were recently altered; the most important of these alterations were to Dratini spawn sites, some of which have become spawn sites for Eevees. Stay tuned to TechRaptor for further news on updates to Pokémon GO. What are your thoughts on Niantic removing the footprint tracking feature? Do you think it will return in later versions? Let us know in the comment section below!